FTP or as it is also called File Transfer Protocol is one of the standard protocols for file transfer, designed to transfer files to the network between computers. Despite being approved in the year 1971 it is still used to transfer files, access remote hosts and distribute software. Despite FTP in its "clean" form being de facto a standard for transferring files between remote computers, it has rather serious security problems. It is all because the password is transmitted over the network in an unencrypted form. However, using this protocol, you can seamlessly connect to FTP servers with the help of FTP client for Mac and not only, view the contents of their directories as well as download files from the server or to the server. It is faster than the standard HTTP protocol, that is why File Transfer Protocol is used to download large files, for instance, movies, games, large programs, or a large number of small files, e.g. music collections. FTP protocol is also widely used by the webmaster, for example, when downloading the site pages to the server. FTP is based on work sessions, supports user authentication and text mode, allows you to perform operations on the file system. The main feature of FTP is that with its help multiple, in particular, binary connection is possible. One of the channels is the command channel that receives commands from the server and returns the answers. The rest are used directly for data transfer. In addition to the above, FTP allows you to reduce the cost of traffic and the time spent on sending large files. To access a server or a remote computer via FTP, special programs called FTP clients are used. File Transfer Protocol can work in two modes — active and passive. In case of active mode, a client sends its IP address and a server creates a connection with it. In case of passive mode, a client receives from a server the number of a dynamic port and establishes a connection with the client via this port. Passive mode is generally used by clients behind the firewall. However, with the great variety of FTP Mac solutions on the market, it is very easy to lose your head. So what is the best FTP client for Mac? Let’s shed some light upon this issue. Commander One is not only an excellent file manager but also the best FTP client Mac solution. Having a dual-panel interface, Commander One makes it easy for you to manage all the files thus saving time for opening and closing a lot of tabs. In addition to dual-panel interface, the app can boast about other handy features that most of the users would find rather attractive. The app allows you seamlessly to connect and work with remote servers through FTP, SFTP or FTPS, WebDAV. It is also worth noting that Commander One supports connections to most popular cloud storages such as Amazon S3, Dropbox, Google Drive, Microsoft OneDrive. With Commander One mount online storages and servers and deal with them as they are your local drives. The app itself does not store any logins or passwords as all this information is securely kept in Mac OS Keychain. Next on our list is CloudMounter. It is another best Mac FTP client with flawless Finder integration. Allows you to mount Microsoft OneDrive, Google Drive, Amazon S3, Dropbox, BackBlaze B2, Box, FTP/SFTP and WebDAV servers in Finder, and effortlessly work with them as if they are situated on your computer. Work with online files just like in the same way as with local files — create, view, edit, delete, and also upload and download files from remote servers. With help of CloudMounter you can easily encrypt all the data stored in your cloud or servers. 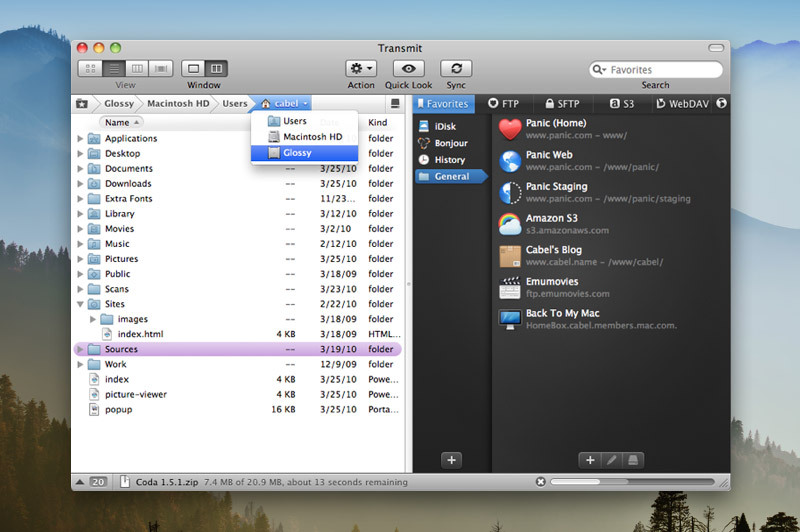 Another best FTP for Mac client is Transmit. Manage your files on FTP, SFTP, WebDAV servers as well as other 11 cloud storages among which are such cloud solutions as Backblaze B2, Box, Google Drive, DreamObjects, Dropbox, Microsoft Azure, and Rackspace Cloud Files, etc. Upload, download, delete, do backups, manage websites, easily limit bandwidth, synchronize or compare files and many more. The key feature of this app is that it makes possible to transfer files at a really fast speed no matter the service. Also, take a look at ForkLift. 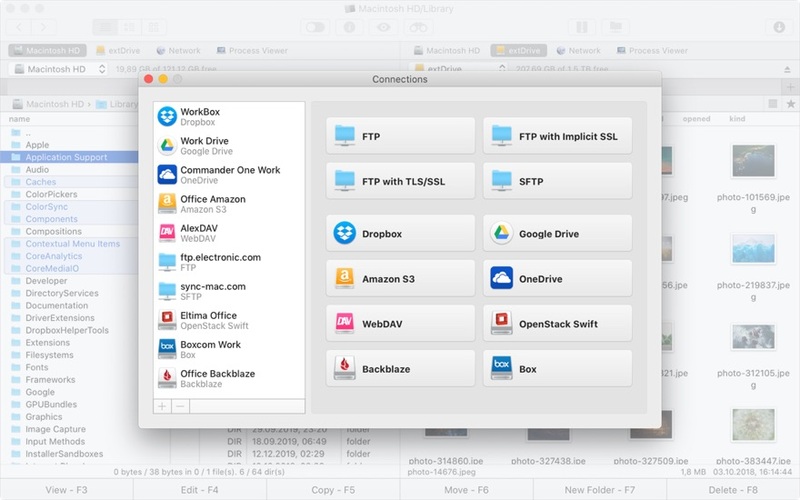 It is a powerful file manager with the ability to connect to FTP, SFTP, WebDAV, Amazon S3 and other popular cloud services like Google Drive, Backblaze B2, Rackspace CloudFiles. It is also worth noting that you can connect multiple servers at a time and even transfer files between them by using a simple drag and drop function. This is an excellent FTP client Mac users would find rather handy, as it offers full control from a keyboard. 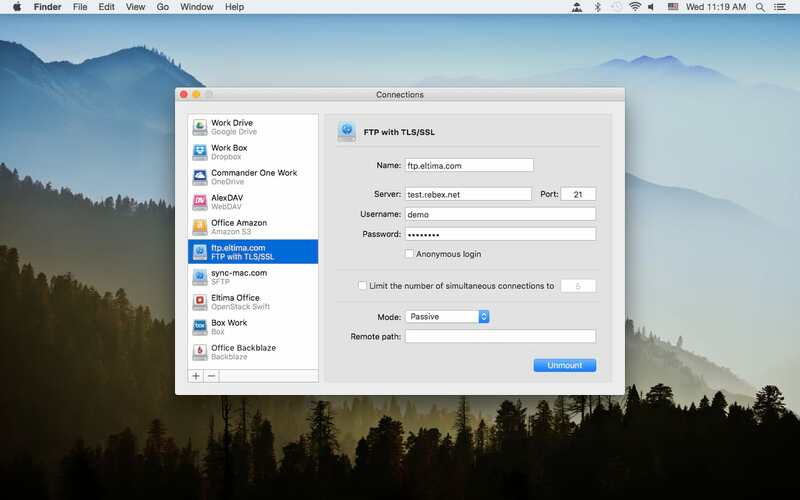 FileZilla is our next example of a wonderful FTP client for Mac and not only Mac. The app supports a huge number of different protocols, such as FTP, FTPS, SFTP, and others. FileZilla has an intuitive two-pane interface, through which you can quickly connect to the server or even several servers, and work with files and folders. Thanks to the built-in Site Manager, you can save logins, passwords and other connection settings for faster and more convenient access to these services. 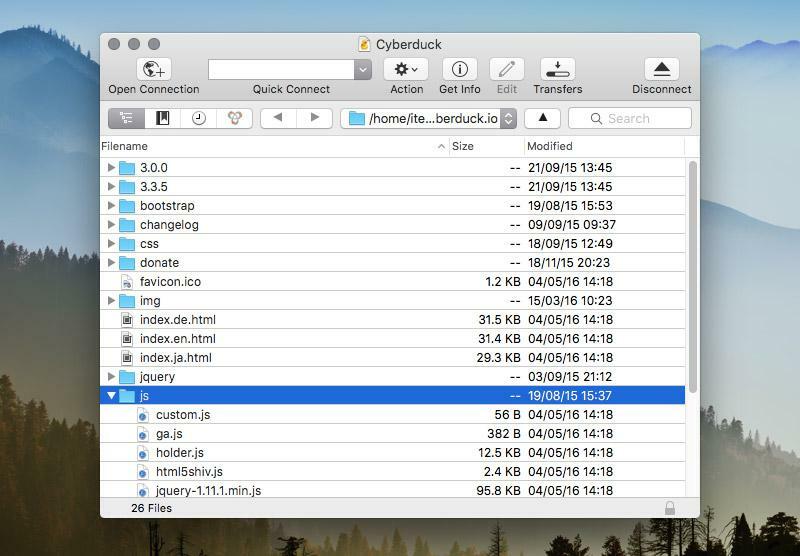 One more popular Mac FTP client program is called Cyberduck. It has a typical Mac interface and a number of free services. It easily saves several configurations of FTP and connects to them without a hitch. The app works with any servers that support connection over FTP, SFTP, S3, Backblaze B2, Azure or WebDAV. Besides that, it has an impressive set of functions. With Cyberduck, you can also quickly change the traffic. We hope that our article was rather informative for you and now knowing some information about FTP Mac clients you get to choose the most convenient solution that would meet all your requirements. Make the tests of your own and choose your favorite FTP for Mac solution. Have a seamless work with FTP servers. Copyright © 2019 Electronic Team, Inc. and its affiliates and licensors. All rights are expressly reserved. The software programs and accompanying documentation are the copyrighted property of their respective owners and protected by copyright laws and international intellectual property treaties. Commander One ® and all related product and service names, design marks and slogans are the trademarks and/or registered trademarks of Electronic Team, Inc. and its affiliates and/or its licensors. All other product and service marks contained herein are the trademarks of their respective owners. Any use of Electronic Team, Inc.’s and/or its affiliates’ or third parties’ trademarks or logos without the prior written consent of their respective owners is strictly prohibited.